We are a Construction Company delivering high quality products in 3 main directions: Construction, Engineering and building materials production. Management of the company consists of professionals having management experience in urban infrastructure development, residential construction and communication infrastructure. Quality management has a high priority at NCC: technical department supervises the ongoing works and responds quickly to any mismatches of the project design or requested quality. Concrete quality is checked by independent chemical laboratory on permanent bases. There is a responsible person for safety in NCC who is developing safety instructions for all kind of works and is arranging permanent training sessions for personal. With sufficient construction equipment and machinery, own concrete and inert materials factory, offices and warehouses, the company has all the necessary means to carry out its duties successfully. All of these factors make NCC successful Company with a growing number of projects and revenues. Company already completed 13 projects since 2009 and has 10 ongoing ones (see Projects). Building of tunnel on Rike territory was one of the biggest city development projects in 2009-2010 in Georgia. 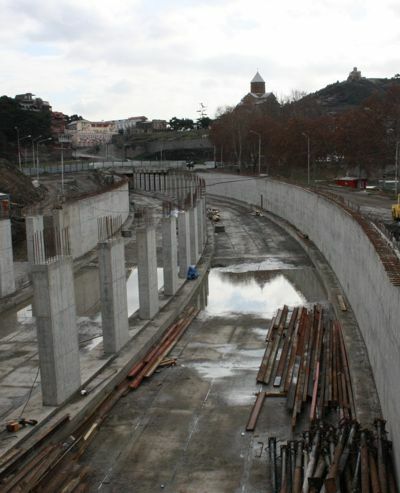 It was the great challenge for NCC as it should be the first tunnel constructed in Tbilisi and third in Georgia since breakdown of Soviet Union. This project was succesfully handled by our company.